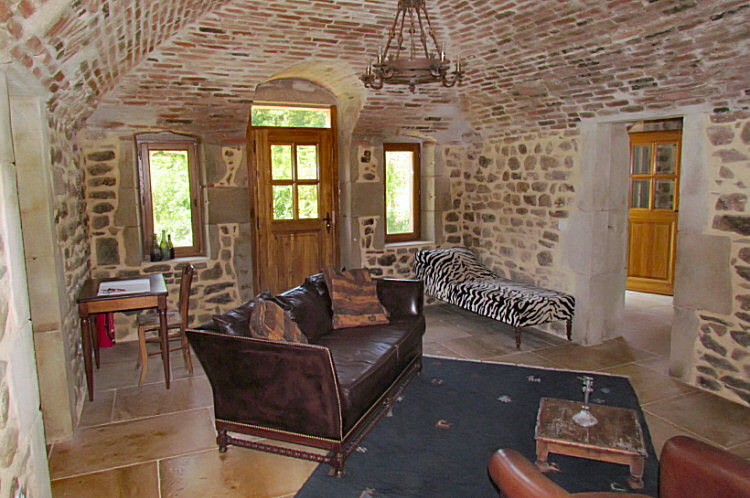 Lodging in a unique location with a beautiful view on a 32-acre historic country estate. 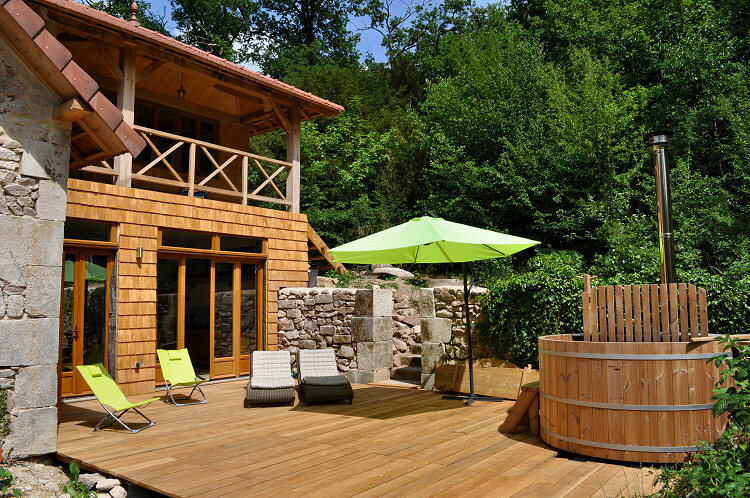 Authentic, robust, luxurious, a lot of privacy and a beautiful view characterise this hunting lodge. 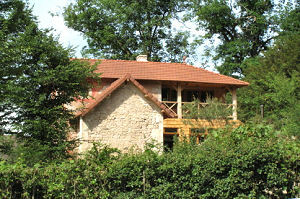 The stately spacious detached hunting lodge (140 m2) has been furnished for two persons (maximum four persons). 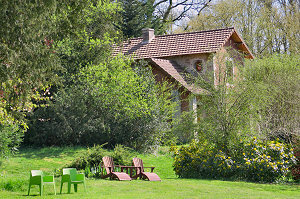 Given its location in the forest and at the lake the house is not suitable for families with young children. The hunting lodge was built around 1810; the lodge was inhabited by the gamekeeper with his hunting dogs until 1899. At the end of 2008, we began restoring and considerably enlarging the hunting lodge with respect for the past, while adding modern luxuries. 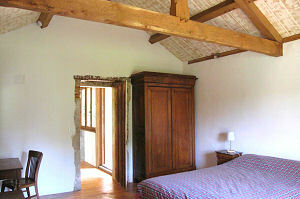 The oak roof structure with wooden peg connections was reconstructed; the thick natural stone wall and the vaulted ceilings were restored. 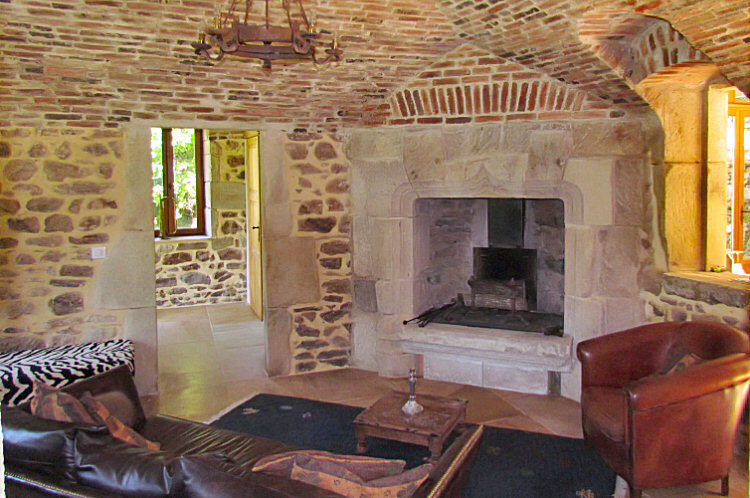 A 14th century natural stone fireplace, probably originally from the large tower in the castle has been installed in the living room and functions as an open fireplace. By making use of large natural stone blocks and the stone stairway of a ruin, a passageway was constructed from the sun terrace to the covered balcony. A spacious two-floor extension has been constructed with many windows and doors resulting in a natural transition from outdoors to indoors. 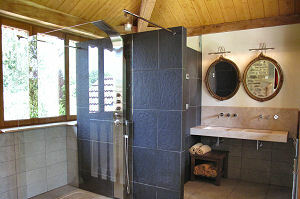 The renovation was completed at the end of May 2011 and the hunting lodge is now available for rental. Entrance hall and toilet area. 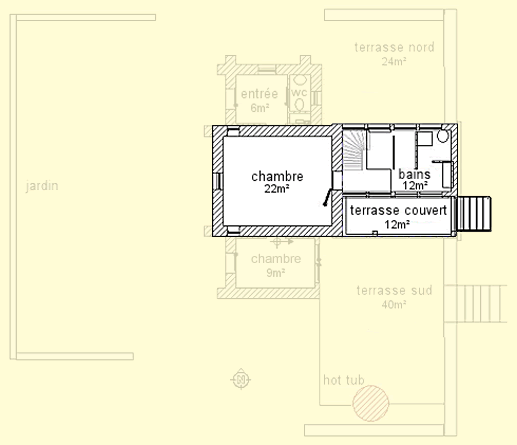 Both of these spaces have a vaulted ceiling. 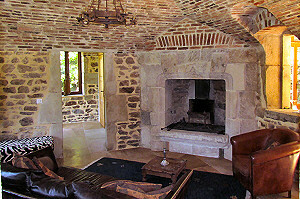 Spacious living room with a vaulted ceiling and a 14th century natural stone fireplace. A luxurious kitchen with built-in appliances (steam oven, dishwasher, induction cooker, freezer/refrigerator combination) has been installed in the light, cedar wood covered extension. 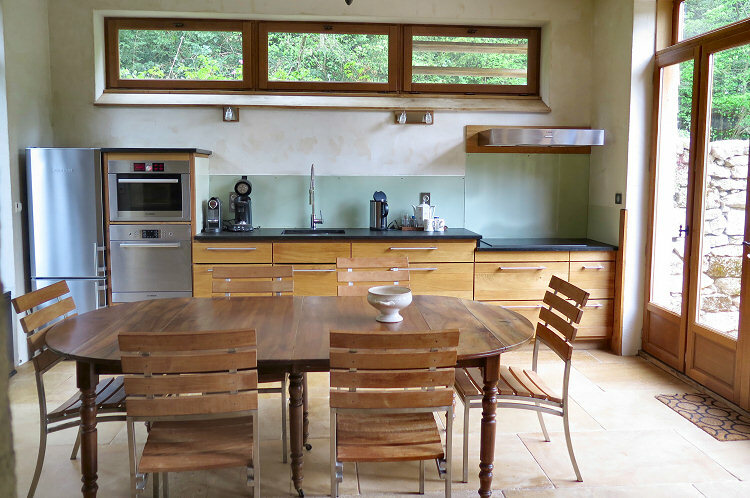 On both sides of the kitchen, three double doors give access to the various terraces with a view of the lake and a spacious garden that borders on the woods. 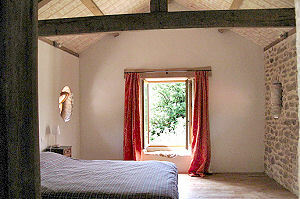 Extra bedroom for 2 persons maximum (2 single beds on different levels). 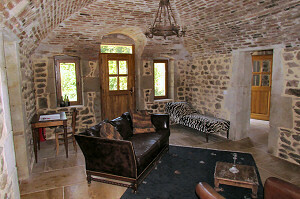 Accessible via the oak spiral staircase, or via the stone terrace via the stone stairway. Spacious light bedroom with luxurious double bed measuring 160cm x 220cm. As the large window faces to the front, you have a lovely view of the front pasture where our Percheron draught horses graze during the summer months. 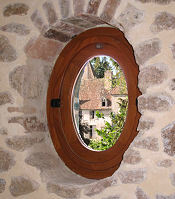 Two oval Burgundy windows (oeuils de boeufs) complete the view of the castle and our lake. The luxurious bathroom is equipped with a separate toilet, double natural stone sinks, a spacious shower with a shower system and floor heating. 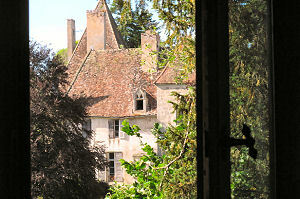 On the first floor there is also a lovely roofed balcony facing south with a view of the lake. The detached hunting lodge is located on a spacious terrain which borders directly on our woods at the back. On the one side of the kitchen, there is a spacious shady terrace. 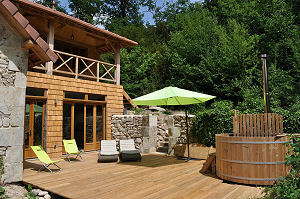 At the back, there is a large wooden terrace with a roomy hot tub - the Source du Bois - that has a diameter of 185 cm. 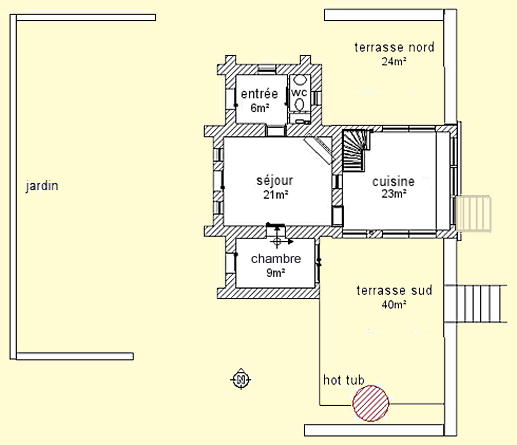 The Source du Bois is heated by a wood-burning stove in the water. Simply filling and firing up the hot tub is a relaxing activity. 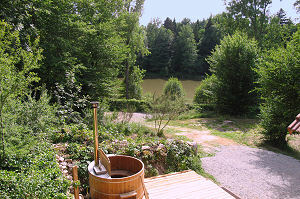 You have a beautiful view of the lake from the Source du Bois. 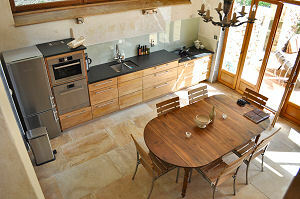 The guests in the hunting lodge have a comprehensive kitchen. They are also very welcome at our table d´hôtes. We regularly serve a 3 course dinner for our guests. Please indicate the day before, the cost for dinner amounts to € 24.00 per person. We are also happy to recommend restaurants in the immediate vicinity. The rental is from Saturday to Saturday. Thank you for not smoking indoors.